Military families often travel for the holidays in order to be with family they don’t live near. Traveling with kids (and quite often while a spouse is deployed) can be tough on these families. I’m happy to introduce Sean Morris, who has some travel tips for making holiday flights a little less stressful. Flying home for the holidays can be fun and exciting or it can be a largely stressful ordeal. There are so many things you have to consider before the trip, such as making sure your home is secure, booking a pet sitter, getting someone to water your plants, etc. Add kids into the mix, and the stress factor instantly rises. Kids always add that element of surprise and uncertainty when it comes to traveling. 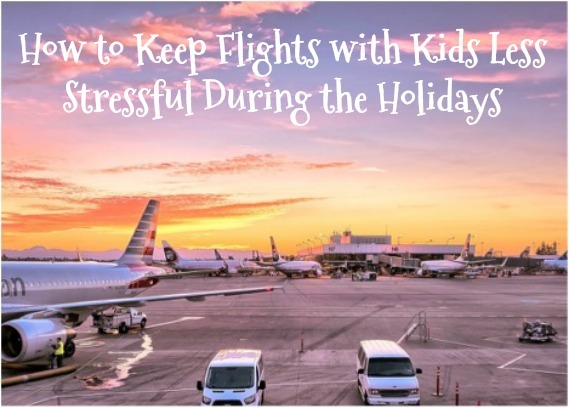 Having to orchestrate a family trip through airports and on flights can be daunting. With some extra preparation, your family trip can run smoothly and be a fun start to your holiday celebrations. Check your calendar and try to travel on off-peak days. If possible, tack on a few extra days to your trip to account for illness, airline delays, or inclement weather. When these issues arise, they won’t greatly interrupt your holiday trip. Traveling on off-peak days lowers the risk of overbooking problems and eases navigation through airports. Learn about carry-on and checked baggage requirements and fees from your specific airline before your trip, as these can vary from airline to airline. Also, visit TSA.gov for current liquid items and their sizes allowed in your carry-on bags. Taking this information into consideration can help you when packing for kids to be sure you have room for necessities, along with snacks and entertainment. Check with your airline about their policy for bringing car seats if traveling with a baby or toddler. The child may tolerate the plane trip better in a car seat that they have grown accustomed to rather than having the opportunity to try to get down or get uncomfortable riding on your lap. Also, a favorite blanket or stuffed animal may soothe them during the flight. You can sign up for text and email alerts for flight delays and cancellations on your airline’s website. Checking in and printing boarding passes online can also speed up your trip through the airport with children in tow. Arrival at your destination can go very smoothly if you book hotels and car rentals before your trip. Waiting until the last minute or not having a solid plan when you arrive can be a nightmare with tired, irritated, and hungry kids waiting on you. Bring plenty of nutritious snacks. Sugary snacks might trigger an unwanted sugar high mid-flight. Also, ear discomfort on takeoff or landing can be alleviated by giving babies a bottle or pacifier and giving older kids gum or something chewy to eat. Some quiet activities include books to read, crayons to color with, drawing or writing in a journal, or hooking up headphones to an iPad or phone to play games or watch movies. Have a conversation with older kids about planning what they would like to do during your trip or have them make a list of all places they might want to visit during the holidays. Give them a camera to take pictures of all the things they find interesting along the way. Their perspectives might surprise you. Pack some basic first aid supplies, just in case. Hand sanitizer and baby wipes are excellent for cleaning up messy fingers or other spills. Some medicines to include might be Tums and Benadryl for tummy aches or allergic reactions, or any other options that might be necessary for your family. Remember to worry less about perfection and sticking to a set plan. As long as you make some preparations for your flight and give your family some extra time to get to all your checkpoints, your holiday vacation can be off to a great start. Sean Morris is a stay-at-home dad and former social worker. His mission aligns with that of LearnFit.org, which is dedicated to providing information on living a lifestyle that’s healthy for both our bodies and our planet.